As discussed earlier, the night interior scenes are lacking in sufficient illumination in general, and lighting schemes employed were different from Hollywood counterparts. Superficially, the differences in bright scenes (daytime exterior) and dark scenes (nighttime interior) seem to correspond to those of “There Was A Father”. But I think if you look at “Late Spring” closely, the dark scenes are placed in quite a strategic manner. “Late Spring” is the post-war production and shooting conditions were far better than during the war. Though the night interior scenes are still in the darker end of spectrum, it definitely has a different lighting scheme/strategy from those during war. The good example is the shot of Noriko during the dinner (Scene 1828, B=0.2246). Enough lighting is on Noriko, bringing out delicate curves and shades of her fingers, texture of her clothes and complexion of her face. Let’s compare Chishu Ryu in both films. In “Late Spring”, Scene 1886 (B=0.1857), the face of Chishu Ryu is illuminated evenly, with slight shades to sculpture his lean face. 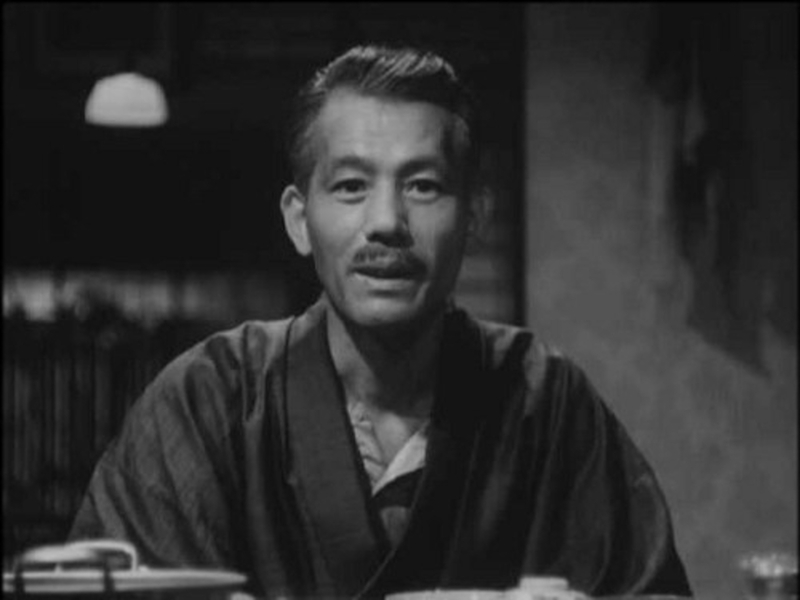 The same Chishu Ryu is given different shades in “There Was A Father”, Scene 3033 (B=0.2422). His stern facial expression aside, the source of light is at far left to give distictively strong contrast. Though overall brightness value is much higher for the scene in “There Was A Father” (much of the bright features are provided by the background), the impression, or the mood, of the frame is not so. In addition, you may notice the loss of the resolution is perceivable in “There Was A Father”. Such loss of qualities can easily be attributed to poor duplication of the existing prints. The night sequence near the end of “Late Spring”, the darkest sequence of the film, affirms the very astute planning for the lighting. The delicate diffusion throws strangely sensual veil on Noriko’s face. This leads us to concentrate on Noriko’s inner thoughts. However, how hard we try to peer into the inner side of Noriko’s mind, how hard we try to solve the puzzle of the vase in the darkness, only fragment of her inner thoughts we can collect is silent void, a big question mark. The audience can attach their own version of interpretation on the vase, Noriko’s expression and the silence. Now, we may say, “we are looking at the bad prints, it’s contrasty, it’s blurred, of course. There is no point in analyzing bad prints.” Or is it?